Almost daily we are asked about the standardization of oleuropein to some % in Seagate’s Olive Leaf Extract. The answer is — Seagate does not standardize oleuropein nor an other phytochecmical in any of our products. The continued representation that oleuropein is the measure of potency in olive leaf extract is false, deceptive, and deliberately practiced by companies that are ignorant of the composition of the olive leaf and are trying to promote inferior products to an unsuspecting public. There is no polite way to say this. The oleuropein myth began in 1969 when the Upjohn pharmaceutical company attempted to use a chemical in the olive leaf to develop an anti-viral drug. They extracted the oleuropein, and further broke it down into elenoic acid, a constituent chemical. In “in-vitro” testing (in lab test tubes) this chemical killed all the germs that were inoculated. However, in human trials the testing failed. Upjohn later determined that the over-extraction created a very unstable chemical that when taken orally would combine with blood-proteins and become inactive. What Upjohn learned, and apparently most present olive leaf extract companies have not (45 years later), is that you cannot improve upon Nature. The Olive tree has developed over a period of 10,000 years to arrive at its unique natural properties that protect it from disease, bacteria, parasites, viruses, insect attacks, fungus and mold. The phytochemicals in the olive leaf are in a precise concentration relative to one another that combine to give this tree those properties. The declaration to the public that just one part of the makeup of this leaf is the key active ingredient is incorrect and ignores the failed experiments by Upjohn. In addition, these companies should be reminded that this is the health food industry where we are not supposed to mimic pharmaceutical production methods and use chemicals to isolate and extract individual chemicals from a plant and then claim them as the key active ingredient. The separation of oleuropein from its other 9 sister phytochemicals will create an inactive product. In Seagates 20+ years in the health food industry, we have seen this same phenomenon happen with many other products — Shark Cartilage and the level of mucopolysaccharides; Grape Seed Extract and the claim of OPC concentration; Broccoli and sulforaphane etc. etc. Companies who don’t even produce their own product suddenly become the experts and want to differentiate their bottle from competitors by placing larger and larger % numbers on their labels for the purported “active ingredient” in order to gain sales. Mucopolysaccharides were not a measure of how shark cartilage could help the joint. OPC’s could not even be measured in a lab. Sulforaphane is not even contained in broccoli. It is produced in the body from another chemical found in broccoli. 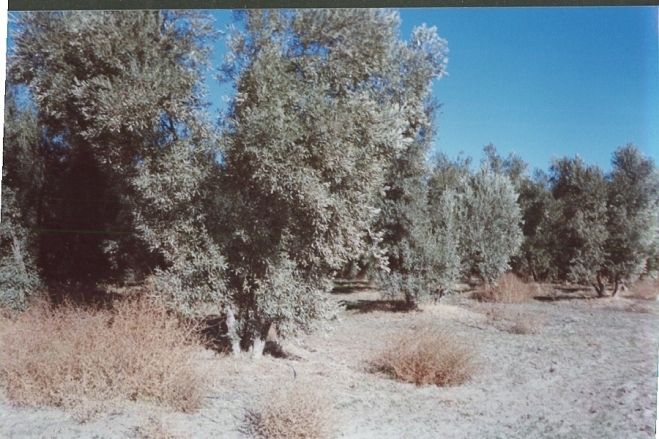 Oleuropein is not the active in Olive Leaf. So, buyer beware — Just because a statement is made in print does not mean that it is true. Do your homework before spending your hard-earned money. When you next hear a manufacturer’s claim that their olive leaf extract has 25% oleuropein or whatever level, you might ask them several important questions: did they happen to grow their own olive trees, process their own extract, have an independent lab report that even shows that the claimed % on their label is the actual level found in their product, and how does the isolation of this one ingredient do anything for the potency in their product. 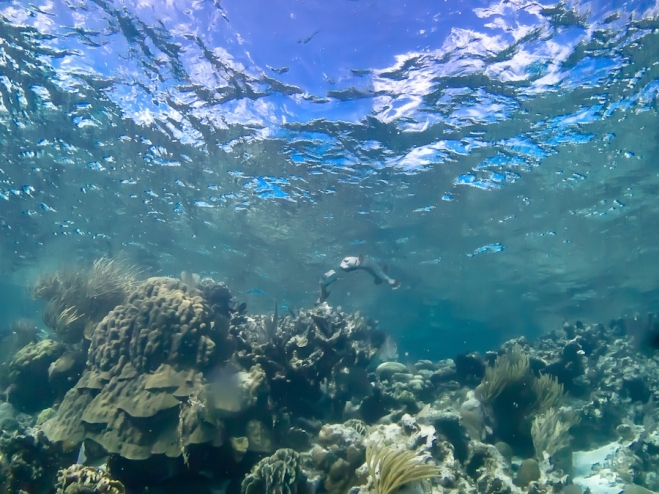 This photo points up towards the ocean surface where two unidentified fish are playing a reef in Belize. Most interesting are the waves taken from below and the circle of blue sky looking like a window on top of the ocean. Always do your homework and doubt what’s out there because our so well earned hard worked money Worth more we can think of. Especially when it’s spent on stuff that doesn’t even work. which is more recommandable for this treatment ? I guess you missed the point about oleuropein not being the measure of olive live potency — the title of this blog article. So take a look at this article page on our website. We cannot make any medical claims regarding the application of olive leaf extract, whether its for cold sores or colds. However, we do happen to grow the trees and process our own extract – without solvents – and try and make the best and most pure product. Hi. I hope you be well. I am doctor Javad Gholami from Iran ( Tehran ). I am pharmaceutical doctor and working pakdarou company as R&D and Bussiness developement manager.Our premier products are oral syrup and Topical solutions. We are start to manufacturing of herbal and supplement oral syrups in our company .Therefor we need to cooperation by other company for manufacturing and buying of Raw herbal materials. I see your web site and your products and I think we and you be have a good cooperation for buying of herbal materials. At the first step , we need Olive leaf extract containe oleuropein. If your company intend to cooperating with us , we and you be have a good and valuble cooperation . I am waiting your kind and seen reply. Thank you for your message. I also hope that you are well and your business is successful. #1 – We are not a supplier of raw materials to other companies. We grow and produce only for our own brand and for some private labeling. So either you did not read it, perhaps you did not understand it or you completely missed the entire point of the article. Either way, this tells me that we would be wasting each other’s time. 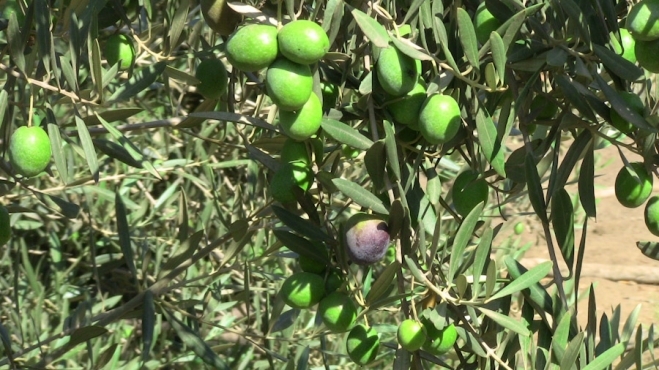 There are plenty of sources of olive trees near to you in the Middle East and Europe. No need to go all the way to California. So, thank you for taking the time to write. Joshua - I have recently purchased your products and so far am really excited about using it. I really want to help restore my liver function back to normal and maybe this product would help. I have read your articles about the measurement of oleuropein. Are you sure there is absolutely no way to measure the % of that? I found a recent patent that says they have found the missing link to effectively extracting and using higher contents of the chemical. What do you think? I like that you make your own products and will continue to buy it but I would like to know what you thought about the new patent? I think you got confused when you read the article about oleuropein in Olive Leaf. Within the article we mention Grape Seed Extract and the chemical OPC (oligomeric proanthocyanidin) and state that this chemical is not measurable. However, Oleuropein is very easy to measure in a lab. To get a patent, you do not need to prove to the patent office that the statement or invention you created is true or real or actually works. All you are doing by getting a patent is protecting your intellectual property …. in other words, just a new idea. (I know because I have 1 of them which in my case actually works.) I have not read the patent you are referring to, just your statement about it which I can comment on — There is no missing link to separating and extracting oleuropein. That is relatively easy to do in an alcohol solution. To claim to have discovered a missing link to doing that is not true. But I think you are completely missing the point. Extracting oleuropein and isolating it has been known and attempted since ~1970 when Upjohn tried to do just that and even broke it down into a more reactive component – elenoic acid. They found that through in-vitro testing (testing it in test tubes) that it killed every pathogen that they introduced. However, in human trials it did not work. The reason it did not work is because this chemical they isolated was so unstable that when people ingested it during their testing program, it combined with some blood serum proteins which neutralized it. There is another way of looking at this which is our company’s philosophy — It took Nature 10’s of thousands of years through natural selection for the present olive tree to develop and survive and thrive because of the mix of phytochemicals that combine to give it all of its properties — resisting bacterial attack, insect attack, other pathogens like fungi etc. Nature did not come up with this specific mixture by accident. So far we have found 8 other phytochemicals besides the oleuropein in the olive leaf. There are probably a few more not yet discovered. If you extract one and leave the others and believe that you have found the secret one active ingredient, like Upjohn tried to do, then you would be destroying a mixture that Nature has provided that already works. We are in the natural foods industry. We are not in the pharmaceutical industry, which looks for plants in the wild and tries to guess what is their active chemical, then tries to duplicate it in a lab. If Nature already got it right, why mess with it? Final thought — don’t let marketing ploys by companies that have absolutely no idea what is really going on in this plant … cloud your judgement. This link to oleuropein while omitting caffeic acid, verbascoside, luteolin 7-O-glucoside, rutin, apigenin 7-O-glucoside and luteolin 4’-O-glucoside, and maslinic acid etc … shows that it is just someone in an office trying to make you into a believer of their mysterious process to sell you their product with some added hype. It almost worked. Hope this explanation makes sense. Andy Blount - I recently bought some olive leaf extract from an online store. Most brands advertised between 10% and 20% oleuropein. I bought one with 20%. After reading your article, I am concerned that these levels of oleuropein have been reached artificially. Will certain types of extract with a higher percentage of oleuropein be unbalanced with nature and therefore be ineffective like the trials with Upjohn? Or will it still be effective as long as the other phytochemicals are present? It’s basically in the math. If you increase the oleuropein level to 20%, then you must be reducing some of the other components because they still have to add up to 100%. Since there are 9 other phytonutrients that are involved in addition to the oleuropein (so far discovered) and these each have an important function, then if you were to increase the level of one, then you would concurrently reduce the levels of some of these others. That’s what Upjohn tried to do and failed. Just as you say, the only way to concentrate one or another of these phytonutrients is to do so artificially — using solvents (ie. chemicals). Actually these companies most likely did not process anything themselves …. they just purchase their raw material from others. Most don’t really have the slightest idea if the 10% or 20% is even in the product as they claim on the label. But it doesn’t matter either way other than to point out to you that these brands are really just labels. They compete on the shelf with others that make claims about their product having the highest level of oleuropein. Anyway, the point we are trying to make is that these trees evolved over tens of thousands of years … and the exact combination of phytochemicals to achieve the properties in the olive tree and its leaves was not a haphazard guessing game. When companies are trying to show on their label some maxed-out number for the oleuropein at the expense of the other chemicals and thereby disrupt the balance that was derived by Nature, then these chemically-altered products will be adversely effected. We have seen this time and time again, where customers complain to us that the olive leaf brand they had purchased had not helped them.